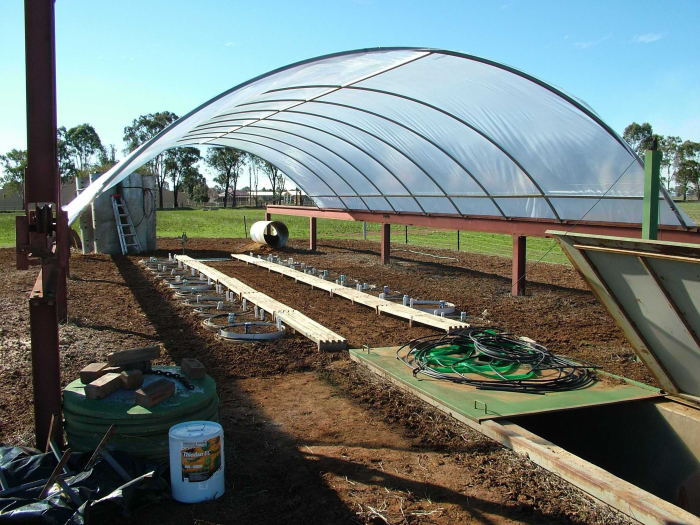 The Charles Sturt University (CSU) Rhizolysimeter is one of the largest root-growth research facilities in the Southern Hemisphere, and is associated with the E.H. Graham Centre for Agricultural Innovation. The complex contains 24 intact soil monoliths (2.5 m high and 0.76 m in diameter) encased in 6-mm steel tubes. The encased soil monoliths are arranged in rows of 12 in an underground rhizolysimeter laboratory that allows access to the side of the soil core from 0.6 to 2.5 m beneath the soil surface. The design of the facility allows for nondestructive, in situ, and high temporal resolution measurements of integrative root growth and soil water dynamics. The soil monoliths can be fitted with a wide range of sensors. The construction of the rhizolysimeter complex commenced in 1995 and was funded by an ARC Mechanism B Infrastructure Grant of $160,000. A further grant was obtained from the CSU Research Infrastructure Block Grant scheme of $30,000 to complete the instrumentation of the facility. The facility became operational in 1998. Currently, each soil monolith has been fitted with six minirhizotron transparent tubes and seven TDR (time-domain reflectometry) sensors. The minirhizotron tubes are 3 cm in diameter and have been installed horizontally at depths of 20, 40, 65, 90, 145 and 205 cm. There are a total of 144 minirhizotron tubes. Analogue and digital image equipment allows for the capturing of root images for quantifying root dynamics in situ. The TDRs are 3-rod, 30-cm sensors connected to a Tektronix 1502C cable tester (replaced on Campbell Scientific's price lists by the TDR100). The TDRs have been inserted at depths of 15, 30, 55, 75, 105, 135, and 190 cm. The system is controlled by a Campbell Scientific CR10X datalogger and 24 SDMX50 multiplexers. There are a total of 168 TDR sensors. The TDRs are programmed to measure soil water content every 48 minutes. The current project (GRDC Project UCS00003), titled “Sequencing Crop Rotations That Best Utilize Biopores To Control Groundwater Recharge and Maintain Dry Catchments”, has the objectives: (1) to determine, in relation to soil depth, how lucerne roots decay in soil and the stability of the remaining biopores; (2) to determine how contrasting soils wet up in the succeeding crop phase of a phase farming rotation following on from a lucerne pasture phase; and (3) to determine differences between crop species in their ability to exploit remnant lucerne biopores and to capture surface and subsoil water. In the preceding project (GRDC Project UCS29), titled “Sustainable Rotations Through Recharge Control by Enhanced Lucerne Water Uptake”, the root and water dynamics of lucerne were studied. Included amongst the significant findings of UCS29 were that during summer the lucerne canopy responded to surface watering (rain event) but not deep soil watering (water table availability). This finding has significant implications for the putative role of lucerne in combating salinity. Further findings from this project can be found in the referenced publications. Funded by the Australian Research Council, Charles Sturt University and Grains Research and Development Corporation. Australian Research Council, Charles Sturt University, Grains Research and Development Corp.